Located North of the Los Angeles basin, the San Fernando Valley was home to a portion of both the San Joaquin main line and the Coast main line, and the entire Burbank Branch. 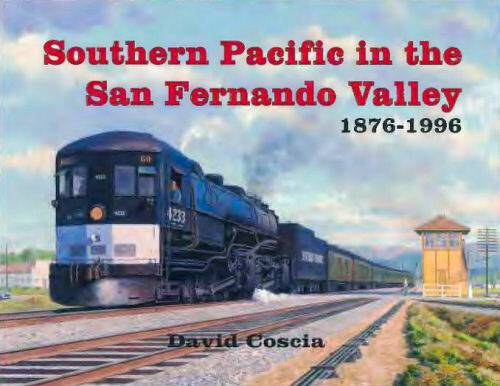 The author traces the history of the Southern Pacific in the area from the 1850's when it was just an idea, the construction of both main lines and the branch line, the operational history of the railroad, and the end of the Southern Pacific in 1996. Iconic locations such as Glendale Station, Burbank Junction, and the three tunnels in Chatworth through Santa Susana Pass were the stomping grounds of both famous and unknown photographers. Many of the photographs are published for the first time. The steam era covers little 4-4-0's to massive Cab Forwards. The diesel era covers the freight and passenger locomotives that dieselized the railroad to the end of the line with SD70M's and AC440's. One complete chapter is dedicated to other railroads in the valley including Amtrak, metrolink, quarry railroads and two monorails. Hard cover.